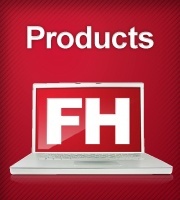 Take a look at the different FIREHOUSE Software modules. Gather and export required and optional NFIRS 5.0 incident data to the state, and additional incident related information like extrication details and NFPA 1710/1720 information. The extensive NFIRS 5.0 codes can be fine tuned using plus-one codes, and valid NFIRS 5.0 codes for a specific field can be accessed by a single click or searched for by keyword. Save time by automatically generating an incident narrative. Investigation records can be linked to specific incidents, or add stand-alone investigation reports. Multiple investigations can be linked together. Track confidential juvenile fire setter data and additional suspect, juvenile, evidence collection, chain of custody details, and optional NFIRS 5.0 arson data. Add photos to the investigation record or link to a directory of photos. Basic EMS reporting is included with NFIRS 5.0 Incident Reporting, and full EMS incident reporting is available individually or as part of a bundled system. The EMS module is tailored to your department’s reporting needs. It includes code set installation options for NFIRS 5.0, NHTSA, NHTSA 2.2 (NEMSIS), state specific code sets, or a local custom code set. Record validation rules are based on the selected code set. Gather NFIRS 5.0 EMS incident data elements and additional data elements that are part of the expanded FH EMS incident management module. Track extrication, water rescue, confined space rescue, and high-angle rescue details, and add multiple types of rescue equipment use.Add multiple patients to an EMS incident. Comprehensive patient reporting includes response and clinical information, patient assessments, procedures, medications, and treatments, and much more. Associate measure/unit/route and instructions with specific medication codes. Quickly replicate assessments, medications, and treatment details and automatically increment times. Update consumable inventory while adding medications and procedures. Save time by automatically generating a patient narrative from entered information. Track all occupancy information including building information, owners and contacts. Associate multiple occupancies with a single property and view detail records for associated occupancies. Maintain extensive preplan information, including hydrant proximity and needed fire flow calculations based on ISO. Prompt to add history records any time name or building information change. Issue, maintain, and batch renew permits. Issue multiple permits under one permit number and link chemical inventory to a specific permit. Track inspections and violations with available industry-standard violation code sets. Batch schedule inspections or automatically schedule a follow up inspection when completing an inspection. Link to preplan drawings, maps, and other external files. Track a variety of information like years of service, proximity to station, phone numbers, email addresses, and insurance records. Maintain confidential information with additional security controls for pay information, casualty reports, Fire and EMS certification details, EMS exposures, and insurance information. Gather miscellaneous staff history records like vaccinations, issued equipment, and special skills. Prompt to add a history record any time rank or status change. Track all aspects of staff training, including training hours, CEU credits, and class attendance. Add as many instructors to a training record as needed. Track certification status using training program records. Add staff and hour or skill requirements for certifications quickly. Display expiring certifications in daily reminder on start up and batch renew them. The Staff Scheduling module allows you to manage personnel scheduling within FH by defining shifts and assigning specific personnel to each shift. Each staff member added to a shift can also include default information to associate with staff activities added from scheduling. Define a schedule that includes as many shifts as needed, add personnel to each shift, then use Staff Scheduling to track vacation days, overtime, or other special categories of time. A dynamic list of shift staff members is available everywhere staff is added in FH, so the Staff Scheduling module helps speed data entry throughout FH. Staff Scheduling is flexible enough to support exchanges when one staff member covers for another staff member in a different shift, but powerful enough to review which shift will cover a specific date years into the future. Set defaults for each staff member included in defined shifts, then create a complete activity for all shift staff with a single mouse-click. You can also view shift events on the department journal when shift coloring is enabled. Keep comprehensive apparatus, equipment, and inventory records with additional fields for specialized types of equipment and equipment maintenance, including specialized testing fields for hose, SCBA, pumps, and other types. Track every aspect of inventory, like out of service equipment, consumables, and maintenance and testing details. Batch schedule or complete maintenance and test detail records. Complete hydrant maintenance, inspection, and repair records. Track time spent maintaining, testing, and repairing hydrants. Calculate flow test measurements automatically based on pressure readings. Choose specific pre-set Hazen-Williams or NFPA flow test equations or establish a custom flow test equation. Add flow tests and activities for multiple hydrants. FH Accounts Receivable is completely integrated with FH. After setting up your lookup codes, you simply use FH as you would normally, adding occupancy inspection records, permits, hydrant activities, incidents, etc. Invoices can be generated as activities are added or, when relationships between account records and specific records have been set up, can be generated via the batch generate invoices feature. Invoices can be itemized with amounts automatically added. Additional invoice items can be added as needed. Account records include information about the entity owing money to your department, including basic contact information and a record of all money owed and money payed by the account. Invoice records details the amount of money owed to your department. All invoices relate to a specific account record. Invoices can be batch generated, added from the billable event, or created from scratch. Once invoices are created, they are printed and sent to the account contact. When payments are received, apply the payments to the invoice. Payments and credit adjustments are entered and applied to an “account”. When a payment is received, the account ID is entered and all open invoices for that account are displayed. Payment can be applied to one or multiple open invoices. You have the ability to void payments, add credit adjustments, or send invoices to collections. Reports that detail accounts receivable are available at every step.